Firefighters work at Notre-Dame Cathedral in Paris. Firefighters doused the smoldering ruins of Notre-Dame with water on Tuesday, the morning after a raging inferno swept through the gothic cathedral in the heart of Paris as investigators tried to establish what started the fire. Hundreds of firemen battled the blaze which consumed the roof and collapsed the eight-centuries-old cathedral's spire for more than eight hours before bringing it under control, saving its bell towers and outer walls. 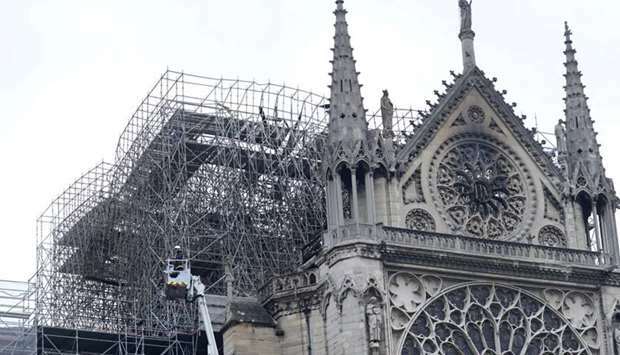 Pockets of fire continued to burn inside the building and thorough checks on the cathedral's structural soundness would be needed, junior interior minister Laurent Nunez said. The Paris prosecutor's office said it had launched an inquiry into the fire. Several police sources said they were working on the assumption for now that the fire was accidental. "It's a symbol of our country that risked being destroyed," Culture Minister Franck Riester told CNews television. Firefighters who entered the burning cathedral saved many of its treasures, Riester said, although some paintings remained inside and risked smoke and water damage. "We will rebuild it together. It will undoubtedly be part of French destiny and our project for the years to come," Macron said outside the cathedral shortly before midnight. France's Fondation du Patrimoine, a charity which works to protect French heritage, is launching an international appeal to raise funds for the rebuilding that is likely to cost hundreds of millions of euros. Other campaigns were swiftly launched in the United States as well-wishers around the world pledged contributions via social media. Two of France's wealthiest men, Francois-Henri Pinault, chief executive of the Kering group which owns brands including Gucci and Yves Saint Laurent, and Bernard Arnault, the main shareholder of luxury group LVMH, said they would donate 100 million euros ($113 million) and 200 million euros respectively. "This tragedy strikes all the French and beyond all those who are attached to spiritual values," Pinault said in a statement. "We are talking of world history, of our Western culture but also of something that is truly universal," Hargrove said. "Notre-Dame means something to everybody."